Last evening author and journalist Lynn Sherr gave an enthusiastic talk on the role of suffragist and women’s rights advocate Susan B. Anthony as part of the Oregon Historical Society’s Mark O. Hatfield Distinguished Historians Forum. Sherr has long admired, studied, and written about Susan B. Anthony. Sherr developed an interest in documenting landmarks and historic sites of important women, women’s organizations, and women’s events in American history. That interest translated into the book Susan B. Anthony Slept Here: A Guide to American Women’s Landmarks that she co-authored with Jurate Kazickas in 1976. Sherr spoke at the First Congregational Church where Susan B. Anthony was a featured speaker at the National American Woman Suffrage Association’s annual convention in 1905. 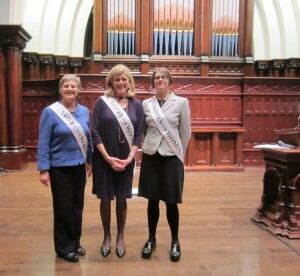 It was only fitting that Lynn Sherr be “sashed” as part of the Century of Action’s Sash Project. 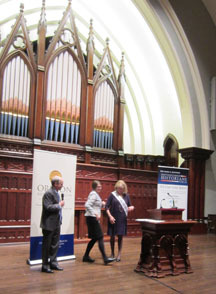 At the end of Lynn Sherr’s talk, OHS Director Kerry Tymchuk invited Century of Action founder Eliza Canty-Jones onstage to sash Sherr. CoA is proud to have another “sash sister” as Lynn so aptly dubbed her new status. Lynn Sherr’s books include Failure is Impossible, Susan B. Anthony Slept Here, Tall Blondes (about giraffes), and America the Beautiful: The Stirring True Story Behind Our Nation’s Favorite Song.